Blogging and content marketing and creation is very important for the face of your business. It is important to keep content flowing on your site so that the general public know that you are knowledgeable and connected. The information you write is important – people need to leave your page better informed that when they arrived. That builds a healthy following and gives you credibility! If you give people worthy information, they will keep coming back for more AND you become the authority. Blogging | Content Marketing Not Your Thing? Don't worry, its our thing! We love blog writing and creating content for our clients. Regular blogging often catapults your content to the top of the search engines. When your local content begins showing up on the search engines, and you have several pages of information for buyers and sellers to look at – guess who will be recognized as the area expert? 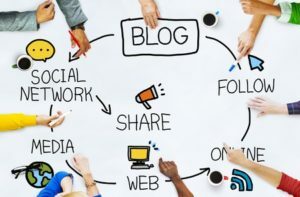 Most template based websites have a blog already connected and its good to add fresh content to your sites on a regular basis. We ghost blog for many different agents. Let Us blog for you too. Weekly, bi-monthly or monthly packages available. Is Blogging and Content Marketing Something You Should Be Learning How To Do?